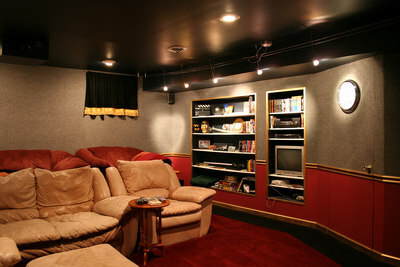 Everybody has their idea for a dream “man cave” or home theater system, but it rarely makes it past the planning stage. As what happens to so many of our life’s goals, stuff just gets in the way. Make the most of your living space, and create the home theater you’ve always wanted. With winter here, there is no better time to get your home theater up and running. With some of these pro tips, you can have your home theater up and running in time to tuck in and hibernate beneath soft blue glow of your television light. You want to make sure that your sound system is setup correctly the first time. Make sure that your speakers are above ear level while you’re sitting down, or about six feet off the ground. Center your viewing area between the left and right speakers and have your rear speaker about three feet or so behind your couch, and at head level, in order to get the best surround sound experience. Too many home theaters have poorly balanced speakers, which can seriously lower the quality of the viewing experience. When remodeling your basement, consider adding noise deafening insulation. If you can, make sure that your home theater room is well insulated and is free from ambient noise, like street noises or trains going by in the distance. If you can, wall off your home theater area and install a heavy door. Insulate the walls with sound dampening panels about every three feet to keep inner-room echoes down. Add a few layers of soundproof panels to the door leading into your theater cave as well, if possible. Reducing noise pollution will also go a long way toward making your home theater just like the real thing. This gets overlooked all too often. People will plan their home theater in upstairs or basement bonus rooms that have a lot of open windows. Having open windows can severely contribute to light pollution in your theater. Even if you’re not using a film projector, having a dark movie viewing space should be the first thing you cross off your movie room to do list. Projector light bulbs are easily procured and offer the ambiance that only a projector can. If you have lots of windows in your theater, consider installing some blackout drapes, or something similar that will keep the light out and the sound in. Since you’ll be spending a lot of time in your home theater, you’ll want the time you do spend in there to be spent in comfort. Invest in some comfy home theater row-seating, or individual recliners. You can find a set of three or four home theater seats for about a thousand bucks online, or for about $1,500 at your local furniture supply store. Money well spent, especially since it will impress the heck out of your friends when the come over for a movie night. Having a great home theater experience is in itself an indulgence, but one can never indulge too much when it comes to spending some quality time in front of the big screen. Some extra amenities are a must for your home theater. Invest in yourself by getting a decent popcorn machine and a supply of movie theater butter toppings. I’ve seen some great home theaters with mini-fridges full of snacks and beer and microwaves. Some of the best amenities that the rich and famous have in their home theaters are: a full wet bar, a candy vending machine, a soda fountain for fresh soft drinks, and a pizza vending machine. There is no end to how luxurious you can make your movie viewing room. The holy grail of all home theaters. Having a large enough screen is the sun around which all other parts of the home theater univers spin. You want to go big. There’s almost no such thing as too big. Many people go with a 50 to 80 inch flat screen TV, but that can get very expensive for a decent model. I suggest installing a decent projector for the optimum theater experience. Projectors range in price from $300 to $1,200 for a very nice model, can project in 1080p HD and have much, much better picture quality than just about every TV on the market. Also, they can project in any size screen that will fit your room. For under $400 you can have a 90 inch high definition viewing screen, compared to the $5,000 to $8,000 you’d spend on a TV that size. There’s just no beating that. Creating a home theater will not only add significant value to your home, but it will become the centerpiece of your home. Your home theater will become a welcoming reprieve for you and your family, no doubt your neighbors will be stopping by a lot more as well. Refinish your basement in style with a home theater and I’m certain you won’t be disappointed.